It's not every day you get to eulogize a polar bear, but that was exactly my bosses wanted me to do when I walked in this morning. Not a problem. After a quick phone call to my pal Rod Hackney, I headed to Asheboro to pay my respects. What I found was a zoo subdued, its many keepers quiet and lost in thought. It was a far cry from the punchy atmosphere surrounding these apex predators' arrival back in late 2002. On that day, everyone held their collective breath as two polar bears rescued from a substandard traveling circus in Puerto Rico took their first tentative steps into the far swankier digs of the North Carolina Zoo. Following years of abuse by cruel circus handlers, Masha and Wilhelm got a second crack at being a bear. Overnight, they began charming visitors with their goofy expressions and playful antics, until these less than pristine animals were considered the N.C. Zoo's marquee beasts. But ten days ago, Masha fell ill - victim to the many afflictions he acquired while living in squalor. The veterinary staff did all they could, but yesterday they had no choice but to put poor Masha down. He was 24 years old, and a very good bear. 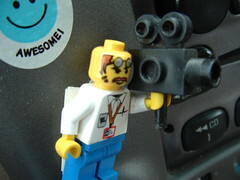 No doubt about it, my very first fancycam was the size of a fridge - and about as mobile. One didn't operate it so much as molest it. With a rickety middle and sticky wheels, proper cameratology was damn near impossible. Today's studio cameras can be whisked across the room with the whim of a fingertip. Pushing the above puppy into place was like slow-dancing with a drunken robot. 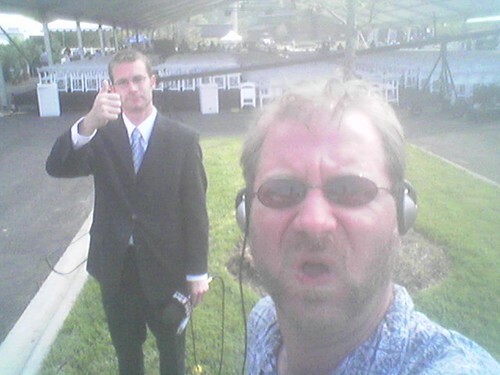 For more than a year though, ole Number Two and I waltzed five time a week, sashaying over a studio floor tattooed with a generation of skidmarks - the footprints of a hundred thousand newscasts. 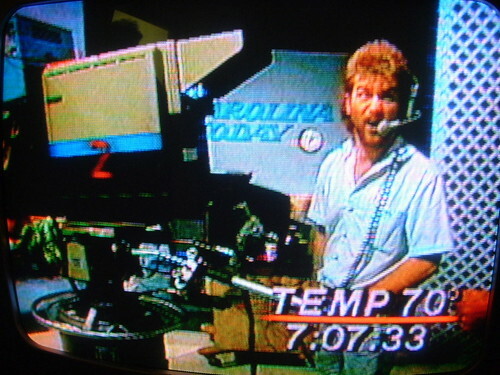 Still, I consider it an honor to have worked on one of the longest running morning news shows yet, Carolina Today. From 1959 to 1998, Slim Short and a host of cohorts broadcast a low budget hoke-fest that pioneered many facets of morning news infotainment. I stumbled onto the set in 1989, one more wash-out in a long line of troubled camera handlers. Before I abandoned the insides for the open road, I ate countless free biscuits, knocked back bad coffee with local legends I grew up watching and became clinically addicted to committing television. Too bad my back was never the same. ...the series will focus on the people who put the news together including the anchors, reporters, trainees, and producers. So where do I send my reel? No great fan of people, I get to meet alot of 'em anyway. From police detectives to pawn shop owners, State Attorneys to strained housewives, college freshmen to career crackheads, I learn from them all. Today's lesson was on perspective, taught by an 85 year old crossing guard with a gold tooth. Though I only spent a few minutes with him, we discussed much: his 60 year marriage, my pilgrimage to the center of our state and what time this might be on tonight. Through it all, this simple man beamed on camera and off, making me wonder what he knew that I didn't. Guess I'll have to stick around 45 more years to find out. And finally, if reality show producers are really smart, they’ll rush out to their nearest City Council or County Commissioner meeting, for nowhere else will they find more bad actors, civic-minded psychopaths and mugging blowhards than in the shallow end of the municipal leadership pool. Think Big Brother meets C-Span meets Kabuki Theater. Don’t believe me? Drop in on any City Hall sometime, wait for the gavel to drop and give a listen. You’ll think you’re being Punk’d. Try as I might, I cannot stop thinking about Paris Hilton. Not the slutty debutante so much - but the apocalyptic camera scrum that tracked her rightful return to The Pokey last week. Not since O.J. and A.C cruised L.A in a white Bronco has the electronic media been so openly ... masturbatory. Well, come to think of it, we pretty much yanked the nation's chain over Michael Jackson's show-trial and that whole Anna Nichole deathapalooza wasn't exactly an exercise in restraint. My point? I don't know that I have one. I'm just flummoxed at how a spoiled socialite's mental descent can cause the world's most powerful country to collectively soil their pants. And this is coming from a guy who spent the better part of a year tracking every move of three American Idol contestants! Thus, there's blood on my hands as well. I'm just glad the Hilton skank pedals her lack of wares on the West Coast - far, far, far away from my electronic beat. Of course, it won't be too awful long before some similar frenzy overtakes the Eastern Seaboard and I too find myself dodging squad car tires for a shot at something insipid. Where is all this fascination with the lowest of lifeforms taking us as a people? Hard to know, but one thing's for damn sure: the end of civilization as we know it will be prominently featured on E! Can you live with that?